Extra heavy-duty 2"x 4" 11-gauge steel mainframe minimizes torsional flex for maximum strength and stability. Quad track roller system operates smoothly and distributes weight evenly. Back and Shoulder pads are 4" thick and contoured for maximum support of the lower back and shoulder areas. Both back pads utilize a quick flip-and-lock mechanism. Easy-access under-carriage plate load system. 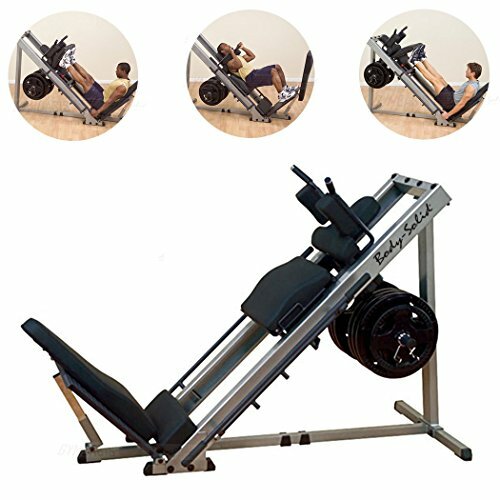 Extra-heavy gauge Diamond Plate foot platforms for both Leg Press and Hack Squat positions. Three lockout positions for user safety and convenience. 2" dia. x 11.75" L Weight Horns. Ideal for home and commercial use. Capacity of 1,000 lbs. Olympic style plates only. Weight plates optional.